An unused great room is transformed into a functional bar fit for entertaining. After downsizing to a home in Ladue, Kelly and Brian Butler were looking for a solution to make their new home practical for their family. 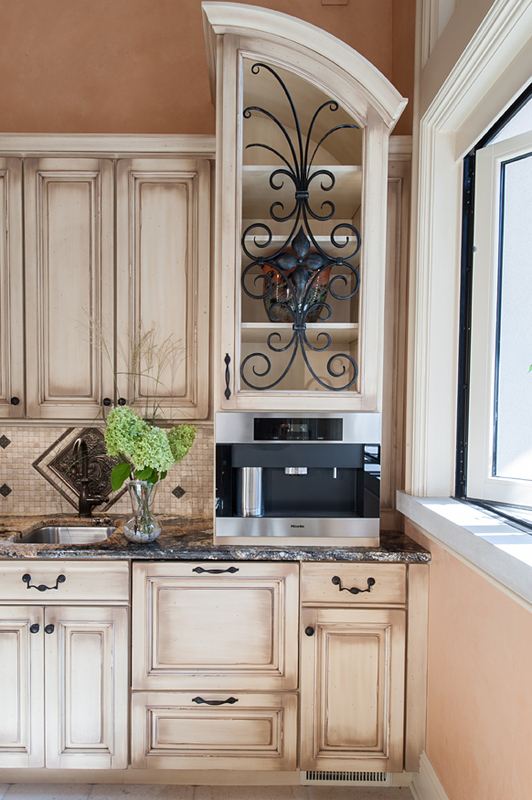 With an established, working relationship with Keith and Jeanne Liston, Liston Construction Company, for more than 15 years, the homeowners knew exactly who to turn to to help them redesign their home to best fit their lifestyle. First up, a typical great room. “We had a huge great room, and like most great rooms, it was one of those spaces that looked pretty, but we knew we wouldn’t use it,” says Kelly. So they decided to add a bar and make the spot a central hub for entertaining. The team decided it would be best to place the bar opposite the existing fireplace. “Having the bar opposite the fireplace gives you a focal point on both ends of the room,” explains Jeanne Liston. The expansive room opens to the couple’s back patio, lending itself to be an ideal indoor/outdoor combination. An exterior door was converted to a pass-through NanaWall window so entertaining both indoors and outdoors is a breeze. The entertainment area evokes a warm, French country feel. A curved radius bar gives the space a unique touch. 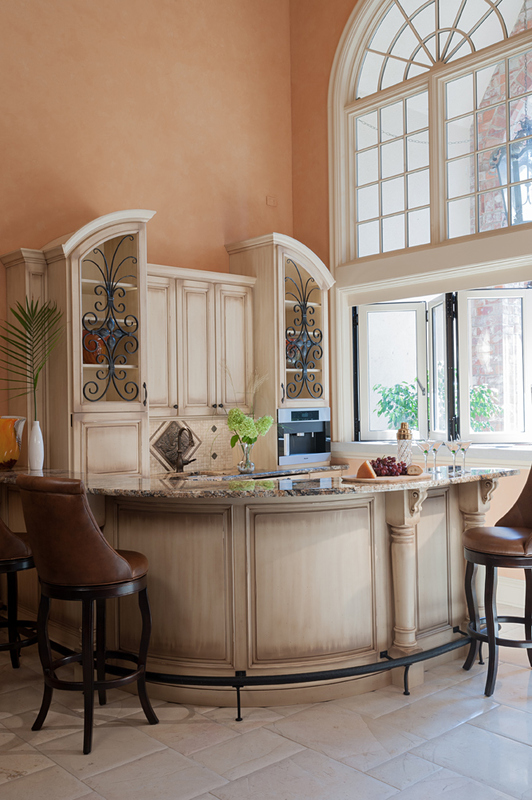 The arched tops of the custom cherry wood cabinets by Marc Christian Fine Cabinetry play off the curvature of the bar. An antique cream and chocolate glaze finish with special antique finish treatment on the cabinetry keeps with the style of the space. The color scheme was chosen to complement the limestone fireplace and travertine flooring. “We kept the colors neutral to match the existing elements,” says Liston. 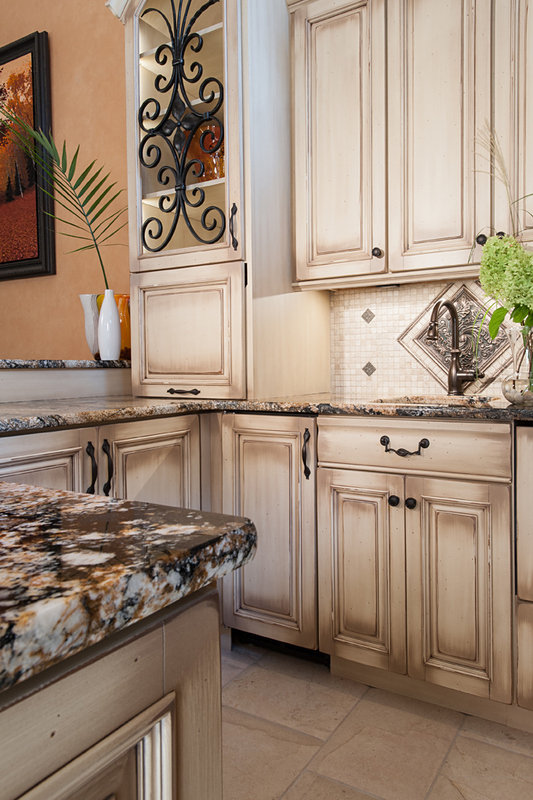 Most of the color came from the granite countertop, which blends shades of cream, gray, black and terra cotta. Now the setting for family gatherings and casual get-togethers with friends, the entertainment bar area is more beautiful and functional than the homeowners ever could have imagined.